I started riding horses when I was three years old. For my family, horseback riding was a tradition brought down through the years; my mother rode jumpers at a farm in her small New Jersey hometown. It was my father, however, who first got me into riding at the same age that many of my friends were just learning how to walk. He showed me films of indigenous people riding horses, to Spirit, Stallion of the Cimarron. From the moment The Saddle Club first flipped onto my television screen, I knew that I was in love. Shop kate spade horse statement earrings here! It was first an old, chestnut Quarter Horse named Peanut. Then came a Morgan/Thoroughbred cross named Peggy. After that, a spotted Appaloosa named Doc. Shortly after was another spotted horse named Monet. Then, an ex-racehorse named Jeffrey. Nearly 20 horses later, we are left with my current two American Paint Horses named Bradley and Jet. After nearly 16 years, I can remember all of their names. But most importantly, I remember the way that all of my horses have made me feel. For some, riding comes easy. The ability to hold your hands steady, to move your leg back behind the girth and push just the right amount, or to hold a smile in the show ring no matter what is going on around you. I, unfortunately, was not one of those people by any stretch. And to be completely honest, not many people in the horse community are like that either. Everyone has their imperfections, even if we like to believe that we are the most perfect horse people on the planet. It took an innumerable amount of patience, strategy, and trust in order for me to ride somewhat well, and I must admit that I’m still learning. A lot of the people I met on the horse show circuit or in my stable were not your typical horse people. While many invision horse people as having unlimited money and luxury cars- I grew up with people that dedicated whatever money they could to putting shoes on their horses or scraping at the bottom of the barrel to get enough money to buy a saddle pad that wasn’t chewed through. See, owning horses is far from cheap. But ironically, the people who have the most delicately constructed barns and the most expensive saddles imaginable often know the least about what truly matters- the horse. Anyone who actually cares about horses knows how much soul they have. They can’t tell if your helmet is a Troxel or a Samshield, nor can they tell if you had to clean stalls for 6 hours to get enough money to ride for half-an-hour. What they do know is that your kindness comes a long way, and that you’re showing for more than just popularity points and ribbons. If it hadn’t been for my parents, I would not have fallen in love with the most expensive addiction I could ever have. Nonetheless, I would do the exact same for my future children- and not just so I could live vicariously through their childhood. Here are some of the most valuable lessons I’ve learned from horses. My hope is that they can learn these, not just by me telling them, but through some of the most valuable experiences they could ever have. 1) Early mornings are temporary. Feeding horses and mucking stalls early in the morning is worth it in the long run. 2) If anyone hands you the reins, walk away. No one should have reins handed to them. If you don’t know how to do the basics, whether it be tacking up or treating a cut on your horse’s leg, you shouldn’t be allowed to have horses. You need to earn your honor. 3) Thank those around you. Hug your mom the second you get out of the ring. Thank your horse for not killing you after they narrowly missed the fence. Give your trainer a high-five before you go into the show ring. These are the people and things that will change you. 4) Expensive things work just as well as cheap things. You’ll never need a $1000 Samshield, nor a new show jacket every year. Spend that money on helping your horse feel better, instead on yourself. 5) Listen with more than just your ears. Horses have a lot to say, even if they can’t speak. If you listen with your eyes and your heart, you will learn so much more than just having open ears. 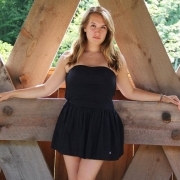 Sara is a managing editor at bSmart and Environmental Law student at the University of Vermont. Outside of her studies, she enjoys spending time with her horses, doing yoga, and cooking.